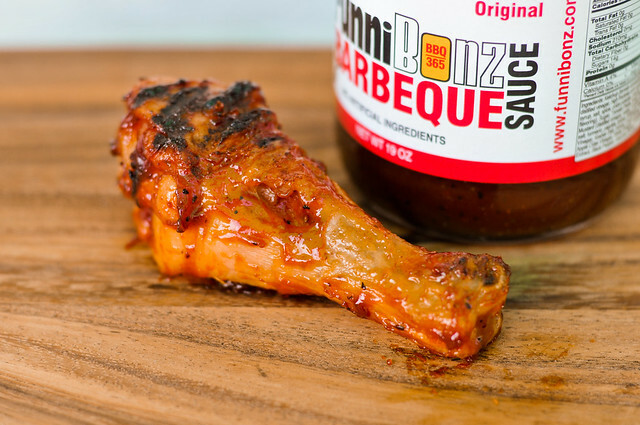 What I can gleam from the FunniBonz site, which is mainly marketing speak, this sauce was given life in 2005 when Jim and Ryan (that's Jim and Ryan from New Jersey to be exact) started a quest to create the best ribs and wings on the planet. It took three years for them to come up with a sauce that they deemed was the most versatile and finger lickin' good. This quest often resulted in them staying up until 4:00am, finding "themselves slap-happy in the kitchen covered in chicken and rib bones," hence the name "FunniBonz." 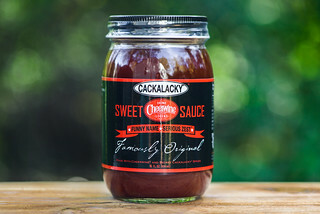 To throw some more of that silly marketing lingo into the mix...despite the silly name, there "ain't nothin' funni 'bout a sauce this good!" 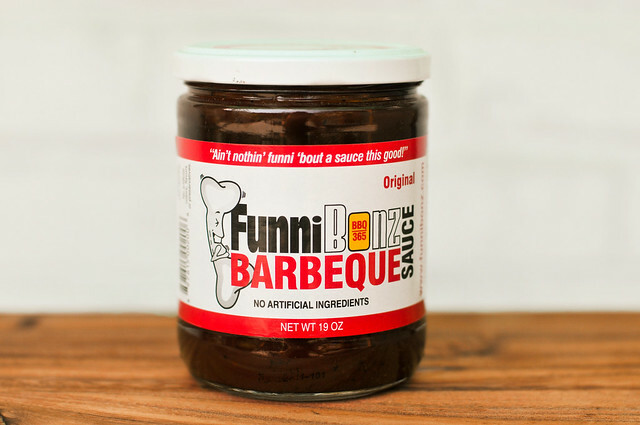 FunniBonz has more than a hint of liquid smoke, with that being the dominate smell on first whiff. The smoke isn't totally overpowering though, as a nice tinge of vinegar is clear and a sweetness that's undeniably ketchup. 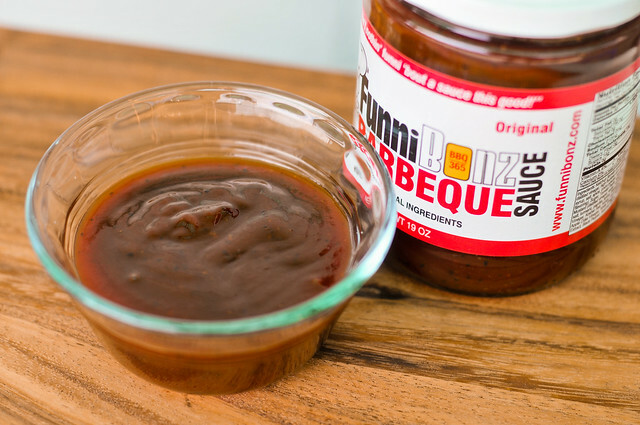 Overall this has a standard sweet, smokey, and tangy aroma that defines barbecue sauce. This sauce weighs in a bit on the thick side of the spectrum. A spoonful sticks to and overflows the spoon, then flows off in a steady stream. In that stream of suace you can make out lots of spices, which are clearly defined in a sauce that coats the tongue so much that it borders on feeling slimy. The raw sauce starts out nice and sweet, with a strong molasses flavor that hides the ketchup that was more prevalent in the aroma. As the thick sauce starts to thin, a strong peppery kick hits that leaves a tingly burn afterward. Through the sweet and spicy, the vinegar and smokiness come through, but at a much lesser degree. The cooked sauce created a beauty of a piece of chicken. The color was a nice robust red with the perfect amout of caramelization. The good looks gave way to a pleasing flavor that was sweet, but not overly so, along with a little smokiness. Although the flavor was nice, there was also nothing that exciting about it either. Just like Sweet Baby Ray's, I thought this had a taste that screams "barbecue sauce," but nothing that really makes it stand out in a crowd at the same time. 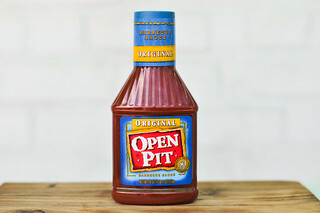 The sauce had a nice, balanced flavor both cooked and raw, but the excellent grilling characteristics it presented would make me recommend this mostly as finishing sauce. 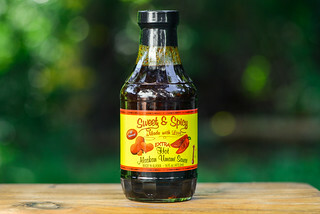 The slightly slimy texture that I experienced when tasting the sauce out of the jar disappeared after it was cooked, and the generic, but good barbecue sauce flavor would make this sauce well suited for a variety of uses, with chicken being the best candidate in my mind. You'll get a picture perfect sauce coating with a flavor that may not wow, but also won't disappoint. Just bought this product at Sam's Club in Freehold, New Jersey. I put some over a baked chicken and had everyone licking their fingers!!! Very good stuff!! !